With Thanksgiving holiday now behind us and jolly memories of family and friends still fresh in our minds, let’s turn to socializing. Yes, more of it. We all need it, albeit in different doses. And that is no different for our four legged companions. Whether a foster or a regular dog owner, socializing your dog is important. And it doesn’t matter if your furry ward is a ready-made extravert extraordinaire or a shy, hide-under-the-couch-kind of recluse, it falls to you, his human to provide the interaction. You are probably thinking - I already do plenty. I play and pet, and I even share my couch. I offer intelligent baby talk when my face gets licked. The dog is obviously happy? As humans, many of us are convinced that the special contact we bring is far richer than the dog nose-centered kind. Alas, delusions of grandeur aside, dogs need to interact with their own kind. and despite appearing basic in comparison, they need to spend time with other … dogs. We might not understand the language they use to communicate with one other, but seeking out opportunities for your pooch to practice it what nature taught them is your responsibility. After all, they depend on you. And in the end, you might discover yourself enjoying it. So without involving any turkey leftovers (no hollow bones, please) I offer you at least two easy nearby places you can take your pooch to get his socializing on. First is your local dog park. According to the almighty Wikipedia it’s a place "set aside for dogs to exercise and play off-leash in a controlled environment under the supervision of their owners." Sounds fun already, no? Some are public, some are private just like country clubs. But what unifies them all is that they all offer a place to run and play. Since I couldn’t find any one solid comprehensive directory of these to recommend, I suggest you just google “dog park” in your zipcode. The second option is your local Meetup group. By typing in your pet's parameters like size or breed next to your zipcode on this site, you are bound to uncover a plethora of local dog “affinity” groups. These typically have a designated organizer, who puts together dog outings or house parties, where you are welcome to bring your Fido to wag his tale at other dogs and their humans. 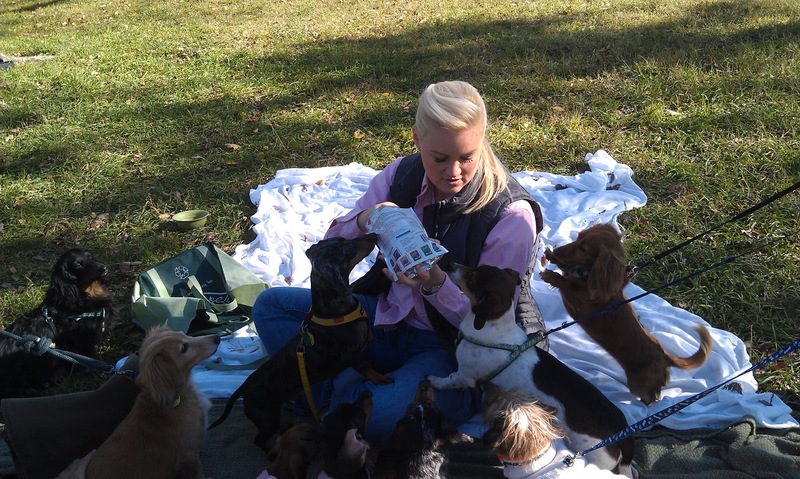 Just like with dog parks, some are open to any dogs, while others are focused on socializing only purebred ones. As a rule you show up at any get-together as your dog’s chaperon. You are expected to bring treats, stories of your dearest and, of course, a camera. After all, it’s all about his kind. I discovered the meetup I belong to by accident. Its organizer stopped by HART (the rescue I foster for) Adoption Fair and found herself immediately kidnapped by none other than me. You see, her Meetup group focuses primarily on dachshunds and I had so many dachshund questions! I learned a lot from her answers and wanted to meet other owners like her, so I immediately signed up for the meetup and had been its grateful member ever since. Here are some pictures from its latest gathering. 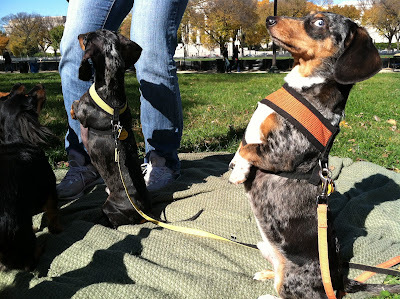 Yes, there were 30+ dachshunds and dachshund mixes at the event, but they all got along, while I got to spend an hour in a company of dachshund-crazed and dachshund-wise dog owners like me! Just look at the pictures, isn't a dream to see your dog this happy and interacting with others?